Unwrapping a new gadget might provide a short-term high, but with more active SIM cards on the planet than people, it comes with an environmental impact[i]. Global sales figures for smartphones, tablets and PCs, are projected to reach 2.4 billion devices for 2014, and that figure is tipped to grow into next year[ii]. Technology has become ubiquitous, especially portable devices like mobile phones, tables and laptops. We use them to keep in contact with friends and family, to work, to get directions, to share information, to study, to settle trivia arguments and much much more. This increased prevalence makes finding responsible recycling options even more important. 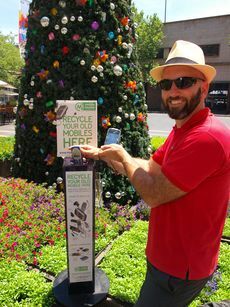 Producer responsibility programs like MobileMuster for phones, 'Cartridges 4 Planet Ark' for inkjet and toner cartridges and TechCollect for TVs and computers help ensure that the non-renewable resources embedded in electronics are responsibly reclaimed. Christmas is the time where we buy, use and throw away more than any other time of the year. Recycling old electronics is just one of the positive actions you can take to reduce the environmental (and probably the financial) impact of Christmas. Making your own decorations, setting up a recycling station at the work party, selecting presents that you know will be used, flattening milk and juice cartons for recycling and responsibly recycling building material are all simple actions with positive outcomes. The 12 Do's of Christmas campaign provides ideas for 12 simple actions and asks Australians to make a commitment to give the planet a present this festive season.